New York is big. New York has three airports. New York and I did not get off to a great start one early (and particularly rainy) morning. I check my schedule like a psychopath. If I have checked to see what time I need to sign in ten times, I will check an eleventh time. Just for good measure. When my schedule is uncertain, I contemplate prayer vigils in hopes that God would show favor on me and not make me trek to Jersey the in the middle of the night just to fly out of Newark. LaGuardia and Kennedy and I seem to get along just fine. I had to be at the airport at six in the morning, so I called my non-English-speaking car service of choice for five-fifteen. That's forty-five minutes to make it to the John F. Kennedy International Airport. That's generous, and leaves PLENTY of room for error. At approximately 5:18, there was no car in sight. Upon further investigation and some garbled phone calls, I was told that I never called for a car. WHICHWASNOTTRUE. So the car nonchalantly rolled in at 5:36. In case anyone was wondering, 5:36 IS NOT 5:15. And the rain made it seem like a better idea for me to have just taken a boat to the airport. It would have been faster. My friend Lucy had picked the trip up so we could fly together. Magically, across town, another absent-minded cab company decided being on time wasn't a priority. Between the two of us, there was a great deal of panic occurring. After a lot of hydroplaning and praying I wouldn't die from the driver's driving methods, I made it to JFK with TWO minutes to spare. Two. I felt the air rush back through my lungs as I went to sign in. I made it. I only had two minutes, and I made it. Remember the air? In my lungs? Moments before? Blood? Circulation? General peace of mind? Panic? Fear? The welling of tears? A strong physical sense of discomfort? Upon further instruction and thoughtful reassurance from other employees present in the lounge, I ran to take a yellow cab to the correct airport. For an additional thirty dollars. My level of rushed desperation made me crazed as I tried getting through security quickly. Take my shoes off? THAT'S FINE. I would have removed my entire uniform and internal organs and scanned them if it meant I could just get on the plane. The plane was boarding, and I ran on, with a giant smile intact that looked like Ronald McDonald when he's around kids with Happy Meals. EVERYTHING WAS FINE, AND NORMAL. I introduced myself to my flight leader. She was forgivingly gracious, and laid back, and I knew immediately we were going to be friends. I worked in the front with her, serving First Class. We did the usual, "Where are you from?" introduction that takes place on every trip. Lo and behold, she was from my home. She had taught at my little sister's high school for many years. She loved the Lord -- fervently and faithfully. The panic that was just moments before wreaking havoc in my heart was replaced by thankfulness for the way things turned out, and a special new friend named Pat. So quickly I learned of her wisdom and was grateful she would share it with me for the duration of our trip. When I wasn't serving beverages to the frequent fliers, I was laughing with Lucy and spilling ice and peanuts more frequently than is probably good. But a laughing flight attendant seems to make for some laughter among the passengers as well. We had a long layover in Denver. Conveniently enough, it was raining. And freezing. And we didn't have jackets. And we only had ballet flats. After approaching the hotel's bartender for exciting places to visit near the establishment, we listened as he spoke of a great love for dolphins and how they needed to be treated more fairly. Puzzled by the lack of relevance to our inquiries, we left and ventured out for Dairy Queen. Because when it is raining and freezing, ice cream is the only solution. This. Is Earls. I ate there last summer and actually started calling a great deal of my friends to tell them about the sandwich I was eating. It was that good. We're talking fresh ciabatta, a slice of green apple, chicken breast, brie and fig jam, and pesto. I just drooled all over my keyboard even mentioning it. Go. There. This was moments before running across the street in the rain, seeking shelter. A guy (that looked to be twelve) shouted, "Miss! Miss! You dropped something!" I stopped in the pouring and freezing rain to retrieve the supposed belonging. Accompanied by an impish grin, he said, "You dropped your smile." And then I tried not to gag on myself and not let the rage flow through my veins as I realized he made me stand in the street for the world's cheesiest pick up line. Maintaining healthy blood circulation inside a heated establishment. 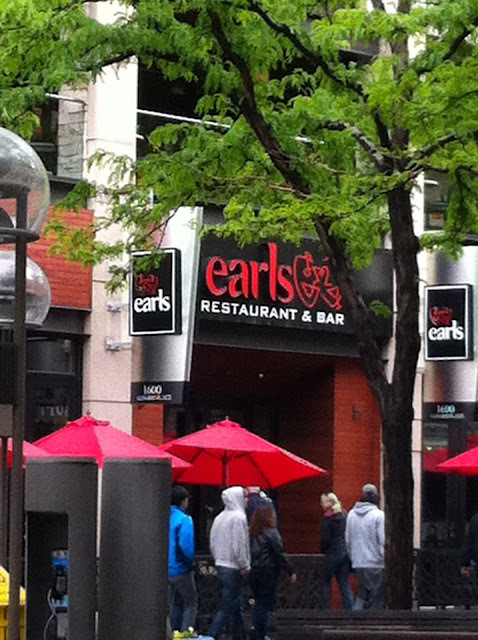 ive been to earls!! it's so good!